I am trying to drive this I2C LCD display with an ATxmega16A4U microcontroller. Both devices are listed to work with I2C clock frequencies up to 400 kHz. The two devices are the only devices on the I2C bus. However, working out the calculations for the pull-up resistor bounds gives some rather odd values. Looking at the uC datasheets, on page 92 lists the max pin input capacitance of 10pF. However for the LCD, it has on page 8 something called the Capacitive load represent by each bus line labeled as Cb, and is listed at a max value of 400pF. I'm assuming I should just add this value to the 10pF uC input capacitance, but this seems really high and the calculations are wonky. Am I misinterpreting the LCD datasheet? Obviously the max allowable pullup resistor value cannot be smaller than the min allowable value. still under the maximum allowable value. The LCD datasheet (almost certainly) means the maximum bus capacitance, not the capacitance that it adds to the bus. It probably adds around 10pF. You can either check with an LCR meter or just set it up with a 2k resistor and look at the rise times. Your calculation makes sense. There is a similar calculation in this TI app note (section 4.1). 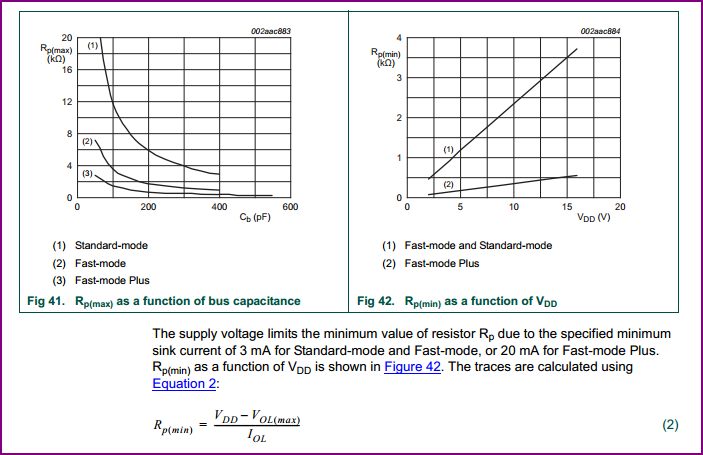 Notice that they use Vcc=1.8V for calculating Rmin. It's conceivable that the Cb is the max bus capacitance which LCD can work with, and not the capacitance which LCD adds to the bus. You could test the capacitance of the I2C inputs by measuring their RC constant. That would provide the order-of-magnitude sanity check. Not the answer you're looking for? Browse other questions tagged i2c pullup or ask your own question.